The simple styling of this outdoor round table makes it perfect for casual patio dining. 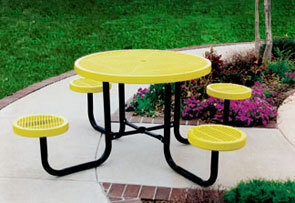 Highly durable, weather resistant thermoplastic coated top and seats will prevent warping, cracking or peeling. Available in a portable design, in-ground or surface mount style. Top and seats are finished with a slightly textured matte Polyethylene coating in any of the color options shown below. 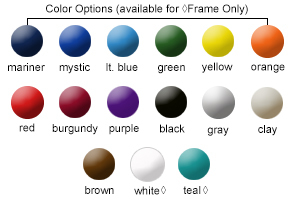 Frames are powder-coated in your color choice. Expanded Steel Top and Seats. In-ground and surface mount models are pedestal style with a 4" x 4" square pedestal in the center to support top and seats. Portable table can be mounted to the surface or into the ground with surface mount clamps or in-ground mount posts which are sold separately in the accessories section. In-ground and surface mount designs do not require an umbrella stand.